The Creighton Model FertilityCare System is named after Creighton University where it originated in the 1970s. It is a scientifically developed and standardized system to assist women and couples in understanding their fertility and cycles, with medical support for abnormalities. The Creighton Model empowers a woman with the knowledge to enhance her health and the health of her family. It is also a cost-effective medical tool to help evaluate and treat infertility and gynecological health problems. This system is based on the observation and charting of essential female biological markers. Women are taught to routinely observe their body for biomarkers, such as bleeding and cervical mucus, and the couple is taught how to record these observations using a standardized recording system. These observations give insight into internal hormonal events, which reveal when a woman is naturally fertile or infertile. The couple can use this information to either achieve or avoid pregnancy. It fosters an appreciation and acceptance of normal healthy body function. As a woman begins charting, she is taught to identify the unique patterns of her cycles, such as her patterns of bleeding and mucus production, as well as the length of each stage of her cycle. She will be able to see the effects of stress, medications, diet and exercise on her health and fertility, or recognize when something is not functioning normally. This information allows the woman to become an active participant in her own healthcare through lifestyle choices and seeking medical help when necessary. “Charting” Dr. Gray says, “doesn’t take a lot of time; only about 30 seconds a day.” It’s quick, it’s easy, it’s couple-building, it’s less expensive than most other options and it has no side effects. It’s the natural choice for family planning. How is the Creighton Model System different from other methods? The Creighton Model System is the basis of the women's health science called NaProTECHNOLOGY (Natural Procreative Technology). 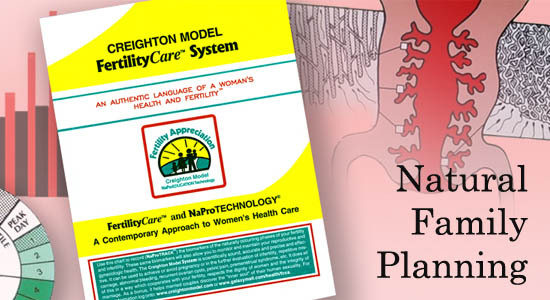 If a couple experiences gynecological difficulties such as inability to conceive or severe PMS, then the Creighton Model charts become highly practical for the physician trained in NaProTECHNOLOGY. Using our experience in obstetrics and gynecology, we can successfully use this method to accurately evaluate pathologic or physiologic abnormalities. This gives physicians and patients a good foundation for menstrual cycle evaluation and treatment options, using the natural processes of the cycle itself. All Creighton Model teachers, called FertilityCare Practitioners, are qualified allied health professionals, who have been thoroughly trained to educate women in the standardized charting of their unique cycles. A FertilityCare Practitioner is equipped to identify potential risk factors and refer you to a physician trained in NaProTECHNOLOGY when necessary. A further benefit of the Creighton Model system is the effect it has on the couple’s relationship. Couples who manage their fertility naturally have a greatly reduced divorce rate. In some studies this is as low as 1 in 150, and most of the studies show this to be independent of faith, income or education status. This is because couples managing their fertility naturally become more in tune with each other, communicate better and appreciate each other more. Through the use of natural fertility management they develop the broader dimensions of their relationship, such as spiritual, emotional and social aspects. The Creighton Model System is also highly reliable. Studies have shown the method’s effectiveness is 99.5% with a use effectiveness of 96.8%. The method does not depend on cycles being regular. It can be easily used even at times of stress, during breastfeeding, pre-menopause, etc.